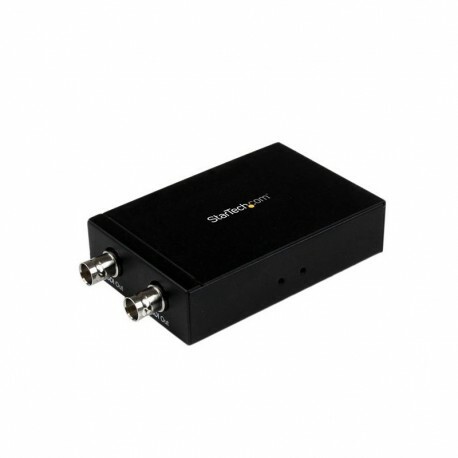 The HD2SDI HDMI to dual SDI converter enables you to turn your HDMI audio/video signal into two 3G SDI video outputs. The 3G SDI video outputs can then be individually extended up to 755ft (230m) over standard coaxial cable for large scale HD-SDI video distribution. To ensure you maintain perfect high-definition video quality, the HD-SDI converter supports resolutions up to 1080p, which lets you convert HDMI to SDI without sacrificing video quality. For hassle-free installation, the HDMI to SDI converter offers a plug-and-play solution that includes pre-installed mounting brackets and requires no software or driver installation. The HD2SDI is backed by a StarTech.com 2-year warranty and free lifetime technical support.